The Endometriosis Foundation of America is proud to be entering it’s 5th year as an Official Charity Partner with the TCS New York City Marathon. On November 3rd, 2019 our 10 runners will take on the 26.2 miles through New York’s famous five boroughs! 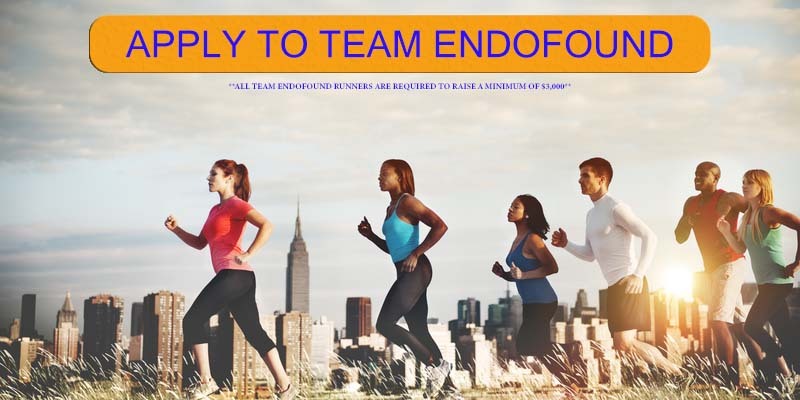 Apply to join Team EndoFound and raise endometriosis awareness and support while training to take on one of the world’s most watched marathons! The first New York City Marathon, organized in 1970 by Fred Lebow and Vince Chiappetta, was held entirely in Central Park. Of 127 entrants, only 55 men finished; the sole female entrant reportedly dropped out due to illness. Winners were given inexpensive wristwatches and recycled baseball and bowling trophies. Today, the New York City Marathon has grown to be the world's biggest and most popular marathon, with more than 52,000 finishers in 2018. Join these incredible men and women in crossing the finish line and raise endometriosis awareness with every step! The first round of acceptance notification emails will be sent on Wednesday, March 27th. Applications submitted after this date will be notified on a rolling basis. EndoFound only has 10 spots available on the TCS NYC team. Interested in sponsoring our runners? Email marathon@endofound.org for information on how to get involved! Please note that EndoFound’s Policy and Practices Regarding Pharmaceutical Industry Interaction prohibits manufacturers of certain classes of drugs from sponsoring our fundraising campaigns and events. Please contact EndoFound for further information.